Politics And Unions: AFL-CIO's Trumka Says Both Parties Have Lost Focus On U.S. Workers : The Two-Way AFL-CIO President Richard Trumka laid out his vision for organized labor, taking on both political parties for catering to moneyed interests instead of concentrating on the plight of American workers. 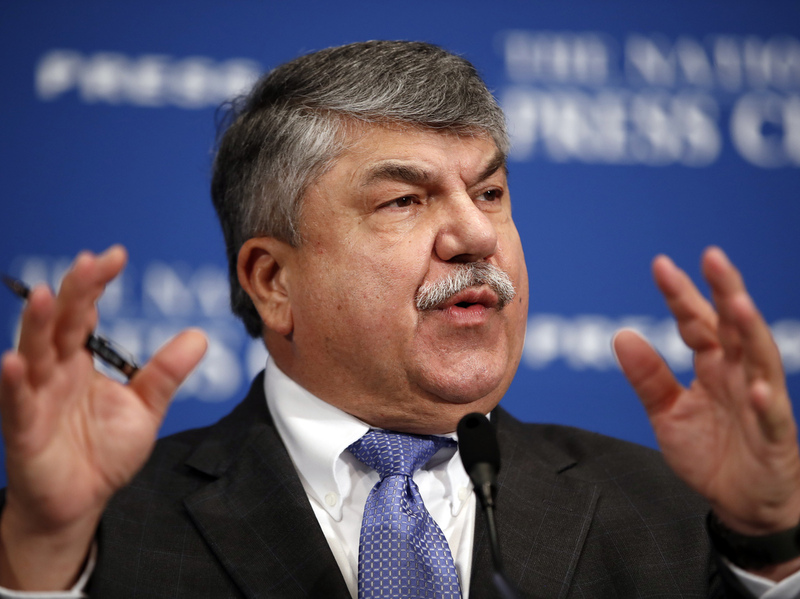 AFL-CIO President Richard Trumka speaks Tuesday at the National Press Club in Washington. "Republicans, and too many Democrats, have rigged our economy to enrich a select few," the union chief told an audience at the National Press Club. "Give every worker out there the right to bargain with their employer for better wages, better working conditions whether you have a union or not," he said. Trumka's cautionary messages about allowing corporations to enrich themselves at the expense of workers, and the dangers of deregulation struck a familiar theme for unions. But the speech was also notable for the way it veered from traditional party politics, calling attention to a growing rift in the once-solid relationship between unions and the Democratic Party. "We'll stand up to the corporate Republicans who attack working people and the neoliberal Democrats who take us for granted," Trumka said. During the last election, 37 percent of the AFL-CIO's membership voted for Trump. Both parties, he argued, are struggling with an identity crisis. In the early days, Trumka and other union leaders supported the Trump administration's position against the Trans-Pacific Partnership and its promise to renegotiate the North American Free Trade Agreement. But more recently, he said, the administration has lost its focus on workers in favor of relaxing rules on employers. "There is a Wall Street wing that seeks to undermine Donald Trump's promises to workers, and there's a competing wing that could actually win some progress that working people need," he said. "I'm concerned that the Wall Street wing of the White House is starting to hijack the agenda." Unions are not what they were during Trumka's childhood in Pennsylvania coal country, when about a third of all American workers were members of unions. That declined to about 20 percent in the early 1980s. Now, it's half that. Trumka himself referenced unions' efforts to reverse that trend, including organizing efforts with white collar workers such as graduate students and technology professionals, as well as hotel and fast-food workers. "I think it is a recognition that, at some level, what unions did 50 years ago is not what they are able to do today," she said.